↑ Oxford English Dictionary, 2nd. ed cites R. Ford Hand-bk. Travellers in Spain I. i. 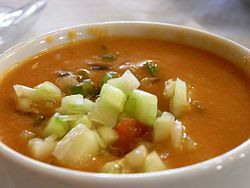 69 (1845) "Gazpacho..is a cold vegetable soup, and is composed of onions, garlic, cucumbers, pepinos, pimientas, all chopped up very small and mixed with crumbs of bread, and then put into a bowl of oil, vinegar, and fresh water."